A Harley-Davidson Bicycle. How ironic is that. Although back in the day, carmakers and bikemakers influenced each other creatively and constantly. This bike is for sale on an auction website. It will probably sell, so I'll copy/paste the text here in case it gets removed. The bicycles were attractive and well made, however. They were painted and pin striped in the same colors as their motorcycle brethren. Advertisements for the bicycle were primarily directed at pre-teen boys and girls; they clearly intended to capitalize on the Harley- Davidson name and mystique of the day. Most notable is the crank; note the ingenious HD. Harley-Davidson received a patent for this design. Also note the wheels; the rims are wooden. 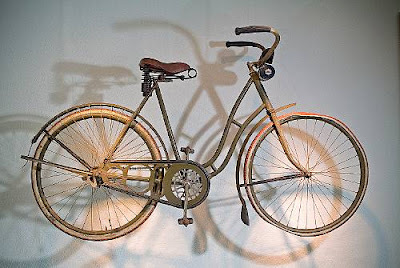 The bicycles were built for Harley-Davidson by the Davis Sewing Machine Company from 1917 to 1924. They were discontinued that year for lackluster sales. Contributing to their demise might have been the number of models (9 different ones) or the high price, which ranged from $30 to $45. This 1918 girl’s bicycle was purchased from its original owner in 1975. The owner was born in 1899 and entered college in 1918. To pay for college she worked for the United States Postal Service as a rural route carrier. She needed some transportation to deliver the mail; the high costs of a car made a bicycle the only feasible choice. She selected a Harley-Davidson bicycle because of the company’s reputation for providing high quality products. This bicycle was accessorized with a dry cell battery powered front lamp which put out about as much light as a flashlight. Unique to the girl’s model was the front chain guard and the web of string covering the rear wheel spokes. This web of string, which is original, kept the long skirts from getting caught in the wheel. After finishing college, the original owner retired the bicycle to her basement where it was stored for 50 years.